Jaipur, 27 November: The three day Indian International Model United Nations(IIMUN) Jaipur Chapter Conference 2016 hosted by The Palace School ended with a formal closing ceremony.The chief guest for the closing ceremony was Princess Diya Kumariji. The conference was attended by young, enthusiastic and talented students from Jaipur and other cities. They discussed the burning issues such as reservation in India, education as a tool to combat terror and claim for India’s membership in the Security Council. The young delegates passed resolutions after intense hours of debates and discussions .The resolution will be sent to the UN later. Students were awarded the title of best delegates, high commendation and special mention. 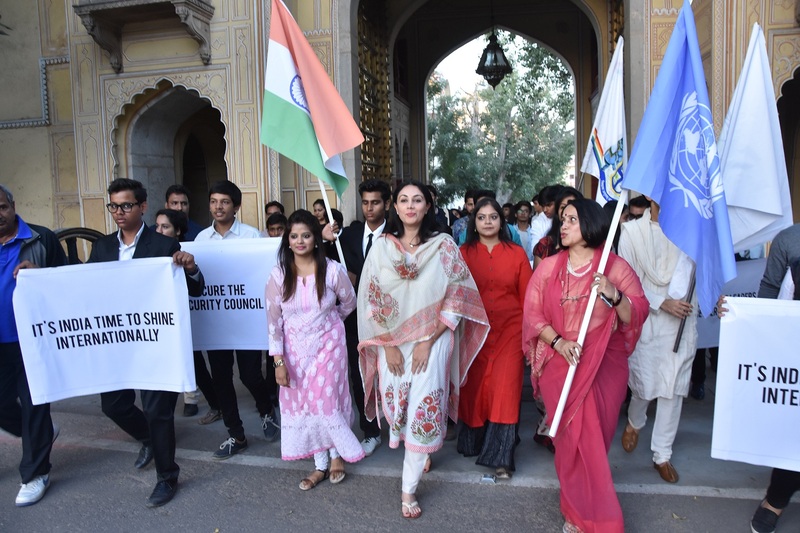 At the end of the closing ceremony Mr. Rishabh Shah, Founder President of IIMUN and Ms. Urvashi Warman, Principal, The Palace School along with over 500 students organized ‘I for India’ march. It was flagged off by Princess Diya Kumariji. The march aimed at spreading awareness among masses for India’s bid for a permanent seat in the UN Security Council.